James C. (Jim) Wofford, 67, was born and raised on a horse farm in Milford, Kansas. He is a graduate of Culver Military Academy, and the School of Business at the University of Colorado (B.S. Bus. Admin. ’69). Wofford, a 3-time Olympian, has spent his life with horses, and is one of the best-known Eventing trainers in the world today. In 2000, Wofford was listed by the Chronicle of the Horse as one of the “50 Most Influential Horseman” of the 21st century, and in January of 2012, he was awarded the Jimmie Williams Trophy for Lifetime Achievement, the sports’ highest honor. A Hall of Fame member of both the United States Eventing Association and Culver Military Academy, Wofford trains at his farm in Upperville, Va., and travels extensively, teaching and giving clinics. Wofford has had at least one student on every U.S. Olympic, World Championship, and Pan-American team since 1978.All four members of the U.S.Bronze medal team at the 2000 Sydney Olympics, as well as David O’Connor, the Individual Gold medal winner, were graduates of Wofford’s program. In addition, 3 out of the 4 members of the 2002 Gold Medal team at the World Equestrian Games were his former students. Kim Severson, the Individual Silver Medal winner at the Athens Olympics, and Gina Miles, the Individual Silver Medal winner at the Beijing Olympics, are both graduates of Wofford’s program. Widely sought after as a clinician and coach, Wofford is equally well known as an author. His first book, TRAINING THE 3-DAY EVENT HORSE AND RIDER, is now back in print after selling out the first print run, while his second book, GYMNASTICS: SYSTEMATIC TRAINING OF THE JUMPING HORSE is currently being revised and updated for republication in the summer of 2012. Two other books, TAKE A GOOD LOOK AROUND, and 101 EVENTING TIPS, are both available. His latest book, CROSS-COUNTRY WITH JIM WOFFORD, is now widely available. In addition, he writes a monthly column for Practical Horseman, the largest monthly periodical in the U.S. dedicated to “English” riding. Beginning with the 1972 Olympics, Wofford has served as the color commentator for many national and international broadcasts, and has worked for NBC, ABC, and PBS. 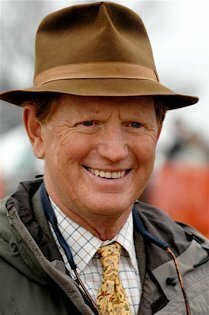 He served as the color commentator for the 2006 NBC Rolex Championships, for the NBC coverage of both the 2006 World Equestrian Games in Aachen, Germany, the 2010 World Championships in Lexington, Ky., and for numerous other horse-related television programs. He has followed in the footsteps of his family as a competitor. His father, Col. John W. Wofford, was on the 1932 Olympic Show Jumping team, his oldest brother J.E.B., was on the 1952 Olympic Bronze medal 3-Day Event team, his sister-in law, Dawn Palethorpe Wofford, was on the British Olympic Show Jumping team in 1960, and his middle brother, Warren, was 1st reserve to both the U.S. Show Jumping and Eventing teams at the Olympics in 1956.His cousin, William Wofford, was a leading steeplechase rider, whose exploits include winning numerous steeplechase races, including The Virginia Gold Cup, plus Horse of the Year honors for his horse Ozymandias. In addition to Jim’s Eventing achievements, he was an active competitor in steeplechase races, rode in numerous horse shows, and fox hunted for over 30 years. Wofford and his wife of over 45 years, Gail W.Wofford ex-MFH, live at their farm in Upperville, VA. The Woffords have two daughters, Mrs. Timothy L. (Hillary) Jones, and Mrs. Charles K. (Jennifer) Ince, and 4 grandsons, James Walker Jones, Hudson Wofford Jones, Lewis Kitchell Ince, and Theodore Brown Ince. The entire family still rides. However, when the boys can sneak away, they go fishing as well.